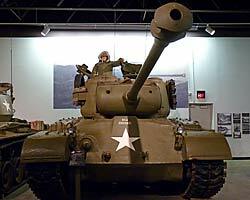 The Patton Museum is located on the Fort Knox US Army Base in Fort Knox, KY. 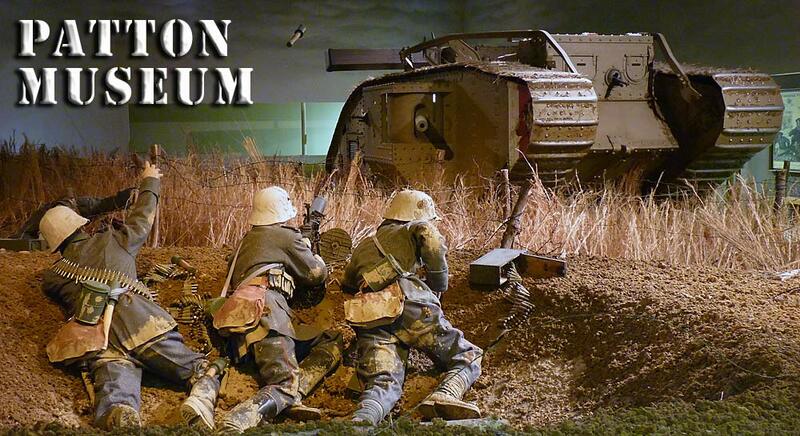 The most visually outstanding exhibit in the Patton Museum has to be their WWI diorama. 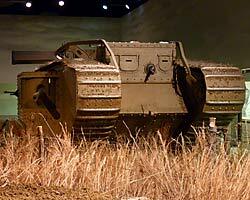 An entire room is dedicated to the life sized depiction of a British WWI Mk V tank assaulting a German machine gun nest during the First World War. The museum's staff have done an excellent job of restoring the very rare Mk V Heavy Tank and you can get a good look at its interior. The German soldiers are attempting to disable the British tank by lobbing a potato masher hand grenade with the hopes it will detonate on the tracks and break the rivets on one of the track links bringing the Mark V to a stop. The diorama is extremely well done and the hand grenade is suspended in mid flight by fine wire. I've seen some very good museum dioramas but this has to have the biggest wow factor. Everyone coming through that room stopped and oooed and ahhhed. 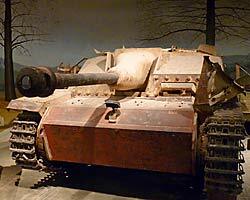 The next most impressive exhibit at the Patton Museum was the German WWII Tiger II / King Tiger (Royal Tiger) tank. Its cosmetic exterior restoration is very good and the interior is very well done too. The armor on the left side has been cut away to allow visual access to the hull and turret interior. The ammo racks are stocked, not with original 88mm rounds as they are very rare, but demilled US 90mm rounds which make the point very well. The Tiger Tank is big, VERY big, and must have truly terrified any allied tank crew that came up against them. 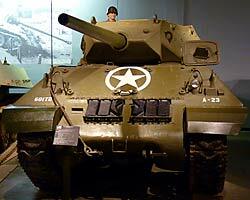 With 7 inches of high quality sloped frontal armor no allied tank gun could penetrate it in a frontal attack. 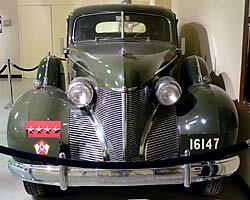 Another interesting museum exhibit is Patton's Cadillac Limousine. This Cadillac is the very Limousine that General George S. Patton was riding in when he was in the car accident that broke his neck and paralyzed and eventually killed him. 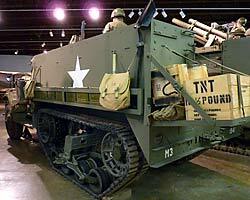 The US Army had the front end replaced and it continued carrying high ranking US Army officials years after the war's end. The exhibit has more details on the accident and a very clear diagram detailing how it happened. There are plenty of US Tanks on display. They range from a present day US Army Abrams M1 Main Battle tank to two M1917 WWI light tanks. 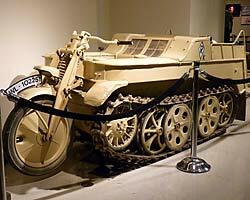 One of these early tanks was amazingly discovered almost entirely complete in an Afghan scrap yard in 2005, then shipped back to the museum and restored for display. The M2 and M3 tanks show the evolution and maturing of US tanks into their more modern and successful layouts that became standard in WWII by all nations. An M50 Ontos tank destroyer is also on display. Developed for the army, the army did not accept the design partly because reloading the six 106mm recoilless rifles required the crew to exit the tank, most likely under fire and the ammo capacity was limited to 3 reloads. 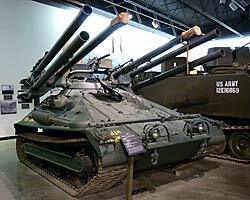 The marines liked its transportability and fire power and used the M50s during the Vietnam War. It is a very striking vehicle and unlike any other tank or self propelled gun that you will see in other military museums. 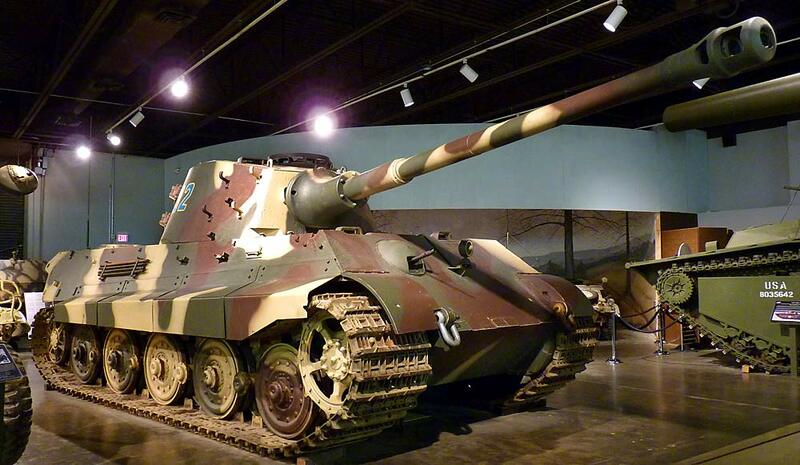 Along with the German WWII King Tiger tank there were several other interesting and fairly rare WWII German vehicles. A well restored VW Schwimmwagen, an amphibious jeep based on VW bug running gear and a VW Kubelwagen was on the floor. 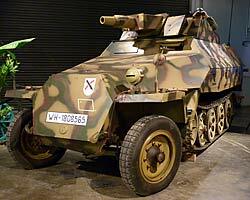 A very rare Kanonwagen SdKfz2 halftrack with an anti tank gun was on hand and extremely well restored. 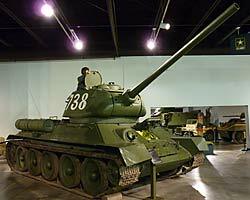 A one of a kind Panther II tank prototype was on the floor. 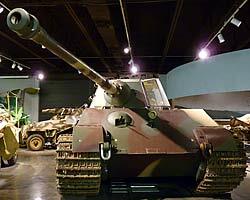 It is visually very similar to the Panther Mk V but is supposed to have the same drive train as the King Tiger and eventually a 900hp Maybach V12 engine. I've read that the armor was supposed to be thicker than the original, but so far all the specsifications I've found on the Panther II were the same for the Panther. 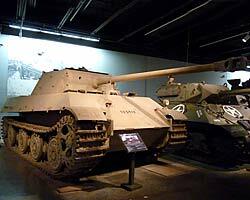 A self propelled tank destroyer, a Marder II was on hand, as well as a Stug III assault gun. The Stug III was found and recovered from a bog in Russia in 1955. It is in amazingly good shape considering it was submerged for 50 years, and much of the zimmerit anti magnetic mine coating is still in place. 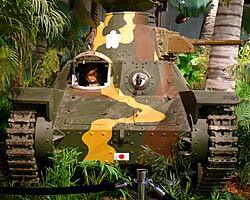 Two small WWII Japanese Imperial Army tanks are displayed in a well thought out jungle diorama. The Type 97 Te Ke tank was visible only from the rear (possibly because the turret armament was incomplete) but the Type 95 Ha-Go tank was easy to see and very well restored and displayed. 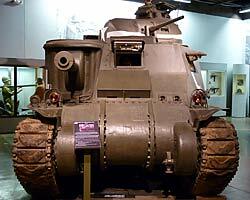 The Japanese tanks are very light and primitive compared to the US Sherman tank of the period. While I was visiting the Patton Museum, US Army instructors were taking groups of soldiers or officers in training through the museum and lecturing about the evolution of armored vehicle development. Their talks were very interesting and if you see a group coming through be sure to listen in. There were also two bomb sniffing dogs and their handlers while I was there. A handler would first place several explosive scented bags around the museum. The dog would then be let loose to search, but would be guided in a search pattern by its handler. When the dog found the package he'd be rewarded with a chew/pull toy and a few minutes of play time. 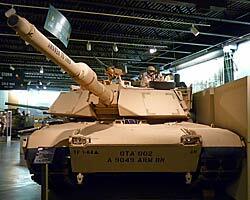 Outside the museum were about 14 tanks and other armored fighting vehicles. They day I visited they closed the museum early without warning so I didn' t have an opportunity to photograph them. There were also more exhibits relating to General George S. Patton inside the museum that I did not have time for. The museum entrance and all of the exhibits are on one level making the museum very handicap accessible. If you are arriving in a wheel chair I would recommend calling first. The museum grounds are fenced off from the parking lot and there is a subway like turnstile to enter and exit through the fence. I'm not sure how a wheelchair would get through it, but they must have a procedure in place for handicapped visitors. There was no food on site but there were several fast food places and restaurants down the highway in Fort Knox. If you bring lunch there are several benches out side and also inside in the foyer and the staff were OK with visitors eating in those areas. The military personnel on duty were courteous and friendly. 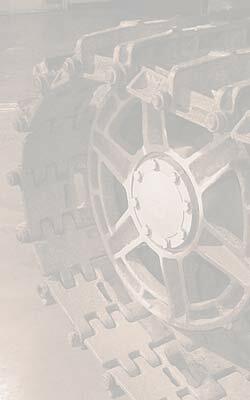 For hours and directions, visit the Patton Museum's Website. 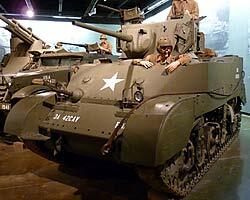 December 2010 - Since I visited in the spring of 2010 there have been major changes to the Patton Museum. 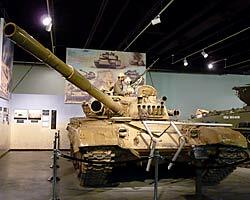 Many of the tanks and other armored vehicles have been removed and shipped to Fort Benning, GA for their new Cavalry & Armor museum that is slated to open between 2015 and 2017. I assume Patton's limousine, uniforms, and other personally related exhibits will remain while the museum is completely rebuilt. I suspect at least a few tanks will remain but I believe the majority of vehicles will no longer be a part of the museum. A search of web blogs turned up a post explaining the tanks shipped to Fort Benning are now outside in the elements in a storage lot on the base. Hopefully that is only temporary as it would be a shame for the thousands and thousands of restoration man hours invested on these rare vehicles to be undone over the next 5 or 7 years. Considering that, consider these pages a snapshot of what the old Patton Museum used to be. The museum is still open during the transition but I would recommend calling before you visit to ensure you are not disappointed. Dec 23 - Here is a link to photos of the Patton Museum Tiger Tank leaving the Patton Museum and other vehicles being moved. One more link of tanks being moved to Fort Benning, GA. This website is not affiliated with the Patton Museum or the Department of Defense.